An unfortunate part of driving is the possibility of a collision that’s severe enough to write off your car as a total loss. 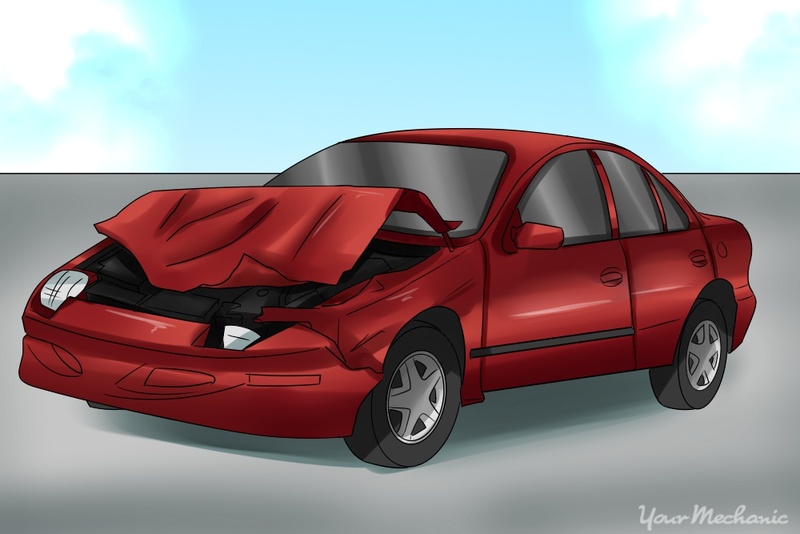 While the most important concern in any collision is the safety of all the involved parties, you’re bound to be concerned about your damaged car. If your car is irreparable or the cost to repair your car is close to the value of the car, it’s possible that it will be deemed a total loss. Knowing the salvage value of your vehicle is important to ensuring you get a fair settlement from your insurance company, especially if you intend to retain the car and repair it. Determining the value of a car that has been salvaged isn’t an exact science, but you can use various calculations to reach a close estimate. You’ll determine the value before salvage, figure out the insurance company’s rates and reach a final figure. Follow these steps to create your own calculations. 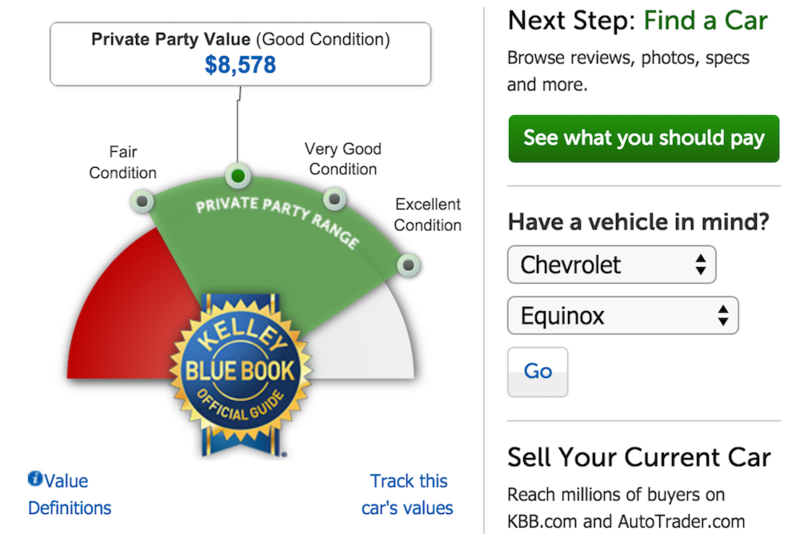 Step 1: Find the value of your vehicle in KBB: Find the make, model and year of your vehicle in the Kelley Blue Book either in print or online. Match the trim level to yours to ensure you have the same options. Check any other options on your vehicle to get a more accurate estimate. Enter the accurate mileage so you can get the best results possible. Step 2: Click on "Trade to Dealer". This will give you the trade-in value for your car. The majority of vehicles are fall under the “Good Condition” category. 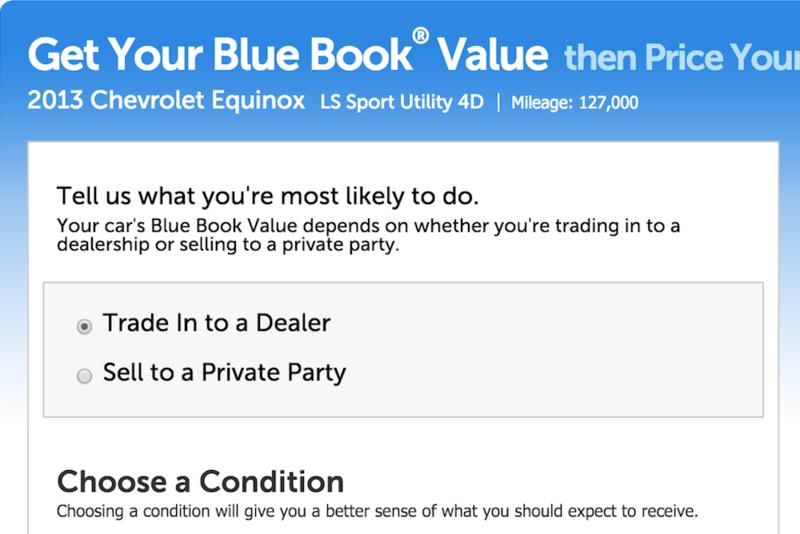 Click to see your trade-in value. Step 3: Go back and select “Sell to Private Party”. This will give you the results for retail value. Step 4: Check NADA for your car value. Check the National Automobile Dealers Association or NADA guide for the market value of your make, model and year. NADA will give you values for rough, average, and clean trade-ins, as well as for clean retails. 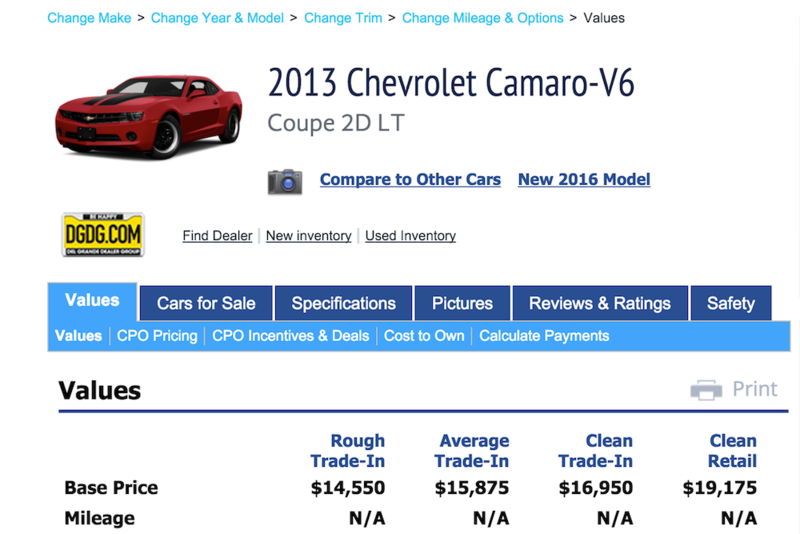 Step 5: Compare the value with Edmunds.com. Check with Edmunds.com for the retail and trade-in values of your car. Tip: While the exact numbers may vary a little, they should be fairly close to each other. Choose the most conservative numbers for your calculations. Step 6: Calculate market value. Calculate the market value by adding the retail and trade-in value from one source and dividing by two. For example, the retail value of your car is $8,000 and the trade-in value is $6,000. Add these two numbers together to get $14,000. Divide by 2 and your market value is $7,000. Each insurance company has their own formula to determine the salvage value of a vehicle. As well, the assessor must consider what will happen to the vehicle and the costs associated with disposing of it. These costs are compared to the expense of repairing it to its original condition. The insurance company will use past auction results for salvage vehicles to determine how much of their costs they can recoup if the car is a total loss. If a specialty vehicle is deemed a total loss, it can often sell for a much higher salvage value at auction than a commonplace vehicle. That means they might be willing to settle for a higher value or at a lower percentage than normal. Step 1: Contact your insurance company. Call your insurance company to find out what percentage is used in the calculation. Generally, it is between 75 and 80% but is determined by each insurance company on their own. There may be additional factors into the percentage above the vehicle repair cost such as rental car charges, part availability, and the type of repair. If a major component is discontinued and unavailable aftermarket or used, your car may be deemed a total loss at a much lower percentage. Step 1: Calculate salvage value: Multiply the market value you obtained by the percentage from the insurance company to get the salvage value. If your insurance company told you they use 80%, you would multiply that by the $7,000 obtained earlier to get a salvage value of $5,600. Often, salvage prices are negotiable with your insurance agent. If you are unhappy with the value you are presented, you can discuss that with your agent. If you can prove why you think the value should be higher such as modifications, accessories, or lower than average mileage, you can often get a higher valuation in your favor. Q: Trouble with transmission hesitating.